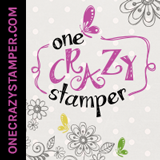 Lora's Crazystamper Blog: For a "Special Teacher"! Today I'm back with a card that I have made for a very "Special Teacher". My daughter has one teacher who is so special to her that I thought I would make her an Easter card. I will try to get more cards done for the teachers but stuff usually gets in the way. I know that Emilee would be quite sad if I didn't get this one done though, so here it is. Off to try and get another card done today. Have a wonderful day & thanks so much for stopping by!